Microsoft Windows 8 will be the next version of the Windows operating system which is aimed at desktops, laptops, netbooks, tablets, servers, and media center PCs. 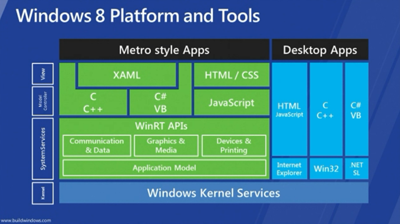 A major part of Windows 8 is the introduction of Metro-style applications which are based on a new application development and distribution framework. This document will summarize the changes and challenges of Metro-style development of 3rd party browsers. Everyone doing work in this area should have access to early builds. What’s needed to accomplish this? Does MSDN or Microsoft Connect or any other program get us earlier access to Win8 or Win8 tools? Big question: would there be licensing and certification issues similar to iOS? Unlike Desktop, Metro apps will ONLY be available through the Windows store. There are no overlapping windows, nor traditional popup windows, everything is chromeless, everything is designed to be consistent across applications. Some interprocess communication is possible within Metro, but it is very limited. Not possible to simply and easily port existing apps to Metro. A significant amount of conventional desktop functionality will not be available. A second app can be shown in Metro app with the snap state. It is shown side by side and you can determine the width of each window via a separator. The top and bottom edges are for per app toolbars. The left and right edge are reserved for system toolbars (This my require Fennec redesign if we end up using it for Metro). You can schedule popup notifications when your Metro app is not running. Metro applications are run in a sandbox/jail environment called the "app container". Process Explorer can show this information for a given process. The sandbox ensures that no application can modify the system or access data from another application directly. Most of the calls from the process to kernel are direct, but some of them like reading a file or accessing the webcam needs special permission. These calls are proxied through a broker that might ask the user for consent. Most resources that an app requires need to be specified as "capabilities" in a manifest file that is bundled with the binaries. Compiles to native code but has some extra syntax flare. It looks like D3D is v11 only based on the naming of the APIs in the above-linked document and the the MSFT employee's response here, and the 4:40ish mark of this video. There is a new concept called contracts for interconnection/sharing with different metro apps. Windows.Launch - Apps that implement this get a tile in the Windows 8 Metro "desktop"
On Windows 8, IE10 is both a metro app and as a regular desktop application. When run as a metro app it does things that are known to be off-limits for metro applications. This section details what we know so far about IE10 that is unexpected from a metro app. Metro instance loads WinRT dlls (Windows.UI.dll, Windows.UI.Immersive.dll) but aside from this, same executable, linked to the same standard libraries for both Metro and Desktop instances. Unlike standard Metro apps, IE runs in the desktop configuration (medium integrity parent process, multiple low integrity children). IE can be suspended according to PE. Security related arguments for a single browser within Metro fall flat considering Metro IE does not appear to be running within the sandbox. The following investigation was done with Windows 8 build 8102 and Process Explorer of 9/20. The image is a screenshot of the latest process explorer. The tree in the far left column is the process tree, with child processes indented from their parents. The second column is their process id, denoted as <pid> in what follows. It seems all metro processes are children from one single svchost.exe in this case <700>, which seems is some kind of souped up DCOM launcher. This makes sense because a lot of the machinery of Metro has been borrowed from COM. As its children, you can see a bunch of Metro apps. Here we have IE10 <4960>, Remote desktop client <5020>, Copper (a 3D game) <5112> and Labyrinth <3524>. Copper seems to be a native c/c++ metro app while Labyrinth seems to be an html5 app. The other child processes of <700> are the RuntimeBroker <2784> which is in charge of accessing privileged data or devices on behalf of regular metro apps and wkspbroker which is the "Remote app and desktop connection runtime broker". To sum up, <2784> and <4948> are not metro apps but metro support infrastructure. We shall limit the rest of the analysis to Copper and to IE because they are the closest to our scenario, but most of that follows will also apply to html5 or C# metro apps as well. As it can be seen in the integrity column, all metro apps except IE10 (and its child) run in the AppContainer integrity level which is new to Windows 8. Very little is known about it except that it is engraved in the process token itself. As a medium integrity process, IE10 can do anything it pleases and it does not require the broker to do file access. For example, If the broker <2784> is terminated, one can still use IE10 without a problem. However, When Copper, running at AppContainer integrity, tries to save the process in the current level it crashes. Upon restarting Copper, the broker was automatically launched again. In Windows Vista and Windows 7, all applications run are by default run with medium integrity. An application that is elevated from a UAC prompt is run at high integrity. Were w,x,y,z are are part of a unique SID which is neither the interactive user SID or the user logon SID. In fact, it seems to be some kind of per-application id. The significance of that is that a good chunk of IPC mechanics become really cumbersome to bootstrap without being able from one process to create a pipe, semaphore, event, or sharedmem and from the other open it by name. In general, browser vendors would prefer access to the system similar to that of Internet Explorer 10. From all outward appearances IE is currently able to bypass security restrictions of the Metro sandbox by running as a medium integrity process, effectively running as a standard Windows desktop application with additional extensions which allow it to latch into the Metro interface. Vendors feel changes should be made to the current restrictions which will facilitate the ability of 3rd parties to compete with Microsoft's products in this new environment. The following section describes some of the areas or changes various 3rd party browser vendors need in order to provide a compelling browser experience within the Metro interface. Memory execution - Virtual* / Heap* apis are necessary for allocating executable memory (JIT). We have been successful in allocating memory using CreateFileMapping/MapViewOfFileEx, but based on comments by ms employees [1,2] it appears applications that attempt to do this will not pass Windows Store certification. Shared memory - While it appears DuplicateHandle is available and passes validation, without an approved method of allocating shared memory, process creation and pipes for communication memory can not be shared between processes. IPC - None of the current pipe apis passes validation. According to ms employee comments no IPC type mechanisms are currently accepted . CreateProcess* api calls do not pass validation. Is there added overhead in going through WinRT networking APIs compared to more direct socket calls? Networking looks doable but there are concerns about a performance disadvantage. What do we have experience with or recommend? Relatively solid "classic" and "metro" performance. Finger and stylus touch inputs. Bulkier than android and ios tablets. This page was last modified on 29 July 2012, at 12:10.